India is a secular country that accommodates all religions. People of all faiths live peacefully in this beautiful piece of land. Christians form around three percentage of India’s population but more than two centuries of colonial rule over India has resulted in the widespread penetration of Christian culture and traditions even among non-Christians . There are many big and beautiful churches in India, but we have made a list of five prominent churches for our reader’s info. Se Cathedral of Old Goa is one of the largest churches in India. The building was constructed in the year 1510, originally made of stones, mud, and straw. It was dedicated to St. Catherine. 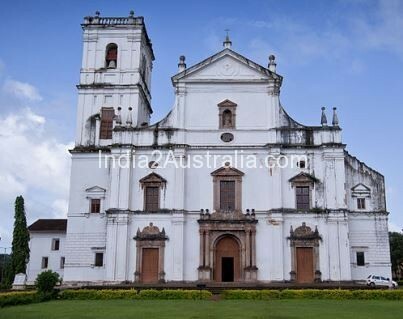 In the year, 1538 the church was elevated to the status of Cathedral with the set up of the Diocese of Goa. The Cathedral as it stands now took ninety years from 1552-1652 to be finished. Se Cathedral is constructed blending two styles: Tuscan in half of the part and half is the Doric style. But, internally, it is built in the style of Mosaic-Corinthian form. Air: Nearest airport is Dabolim with frequent flights from Major cities in India. Dabolim is 30km from Panaji. Rail : Two train stations are nearby – Vasco da Gama and Margao- also have a number of trains arriving at Goa from the rest of the country. Bus: There are frequent bus connections to Old Goa from Panaji and other places in Goa. The church is named after the famous saint, Gregorious Geevarghese, popularly known as Parumala Thirumeni. Situated at Mannar in Kerala, church belongs to Malankara Orthodox Syrian Community. The Church contains the tomb of Saint Gregorious Geevarghese. It was in 1947 that Mar Gregorious was blessed and declared a saint . The present church building is a newly constructed one which was consecrated in year 2000. The church building can accommodate around 2000 people. Due to the presence of the Saint’s tomb, this church is considered as a pilgrimage site by Christians around the world. Parumala village is located on the banks of the River Pampa. Before the establishment of the Church this area was settled by Brahmin families. For reasons unknown, they all moved to other places. Soon Parumala became notorious as a haunted place where people did not dare to go after sunset. Later, this land became a paddy field and remained so until it was given away for Christian missionary work by the land lord. An academy was set up here with the assistance of Malankara Metropolitan Joseph Mar Dionysius. Because of this, two acre of land was gifted to the Malankara Metropolitan by Arikupurathu Mathen Karnavar. A very simple building “Azhippura”was constructed on the land. Syriac Classes were conducted for the Protestant Layman under the supervision of Friar Yakob. It had a humble beginning as a seminary established by Joseph Mar Dionysus . Later, responsibilities was handed to Mar Gregorios, who constructed a temporary church in 1895. A new church has been constructed in the year 1995 by the renowned architect Charles Correa. By Air: Parumala church 120 km from Cochin airport. By Train: . Nearest railwaystation is Chengannur Railway Station which is 10km away from the Church. 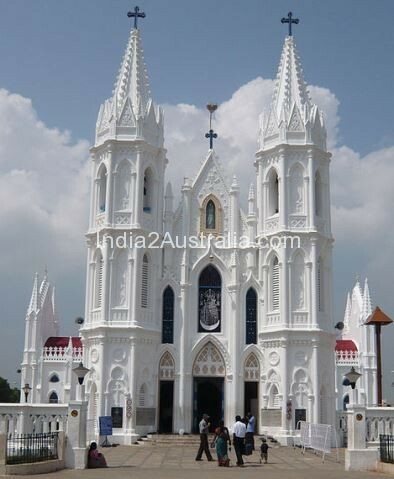 Basilica of Our Lady of Good Health, situated in Velankanni, Nagapattinam district of Tamil Nadu, is the most famous church in South India. It is popularly known as the “Lourdes of the East”. Two miracles believed to have happened atthis place which contributed to the establishment of the church. A shepherd boy named Tamil Krishnannesti Sankaranaranayam who was taking a nap beside the road, woke from his sleep seeing an apparition of Mary standing before him holding a child in her arms. Both Mother Mary and Baby Jesus had a glow of white light emanating from them. Mother asked for milk for her baby and the boy gave all the milk he had. The boy’s master got angry hearing that he gave away the milk free, which he was supposed to be delivered to someone else. But when they looked at the pot, they were surprised to see the pot filling up with milk until it spilled over. Astonished, Tamil and his master ran back to the pond, and Mary and the child appeared to them again. Thereafter, the pond became known as Matha Kulam (“Our Lady’s Pond”). The other incident is of a crippled boy who was supporting his mother by selling butter milk to travellers, suddenly saw a bright light appear before him. A mother with a baby boy asked for a cup of butter milk for her son and the crippled boy gave them what she asked. Afterwards Mother Mary asked the boy to go to Nagapattinam to inform a certain Catholic man to build a church for her. To the boy’s surprise he was cured and he could walk to tell the man about the miracle. As instructed a church was established here and a statue on the altar of Mary holding Jesus Christ as a child was placed. The statue became known as Our Lady of Good Health. Many years later the Portuguese modified the building to accommodate the increasing number of devotees. Offering candles to Velankanni matha is believed to invite the blessings of Mother Mary in fulfilling the wishes. By bus: There are regular buses from other major cities of the country to Velankanni. This UNESCO Heritage listed church holds the mortal remains of St Francis Xavier. This is one of the oldest churches in India. Bom Jesus means Holy Jesus. 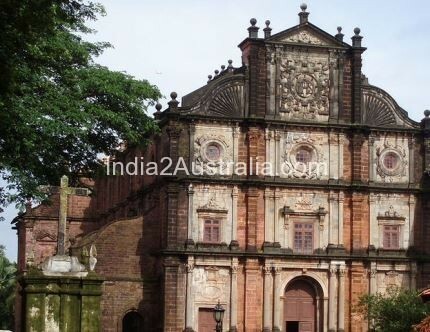 This Jesuit church established by the Portuguese invaders, is India’s first minor basilica, and is considered to be one of the best examples of baroque architecture in India. The construction of church began in 1594 and the church was consecrated in 1605. The mortal remains of Saint Francis Xavier who died on Sancian Island on his way to China, was first taken to Portuguese Malacca and two years later shipped back to Goa. Every ten years the body of the saint is kept for public viewing. 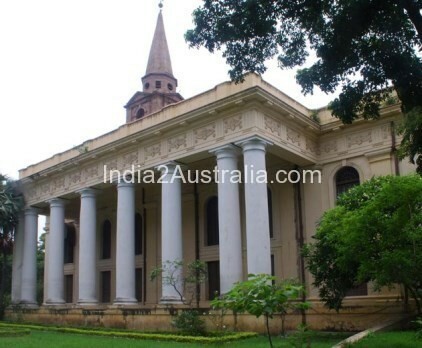 St. John’s Church, was one of the first building erected by the British in Kolkata. The church construction began on 1784 and it took three years to complete. The money was raised through a public lottery. The church was constructed in an old graveyard. The church was modelled was modelled to the St Martin-in-the-Fields of London. The British plundered Gauda, the ruined city on the India-Bangladesh border for the stones for building the church. The Last Supper, painted by Johann Zoffany, modelled after Leonardo da Vinci’s Last Supper is one of the main attraction of the Church. The portico and the steeple are the peculiarities of the colonial architecture of the church. The internal designs of the st. John Church of Kolkata are a true reflection of the churches of Greece. Inside the Church, there is a cemetery where the graveyard of Job Charnock is laid. What’s more, there are other graveyards of Julius Imhoff and Admiral Watson. People from around the world visit Church of Kolkata for its beauty and grandeur. Its serenity gives a sensation of perpetual bliss.